Fusarium wilt is a common tomato disease that causes yellowing of the leaves starting with the lowest leaves first and progressing up, and finally overall wilting of the plant. The infection enters the plant from the roots. The disease affects the plant's vascular system, blocking the flow of nutrients. Yellowing of the older, lower leaves, which soon die. Yellowing moves up the stem into younger leaves until even the top sections of the plant are affected. Diseased plants become progressively more yellow. Reddish brown streak on the roots and stem even extending to the top of the plant. The fungus is soilborne, and spread by the movement of contaminated soil by equipment, irrigation water, or wind. The pathogen can survive on infested crop debris. The fungus can survive for years in the soil but only causes infection at temperatures above 75 degrees F.
The best prevention is to plant resistant varieties, of which there are many. Practice crop rotation on a three-year cycle with non-hosts. 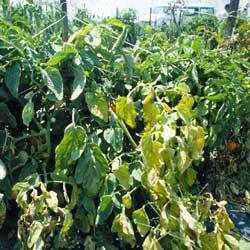 Remove crop debris, volunteer tomato plants, and weeds that can host the disease. Add more organic material to the soil prior to planting. This Increases soil tilth and improves water holding capacity. Fungicides are very effective at controlling the disease. Pasteurize greenhouse soil if the disease was present the previous season. 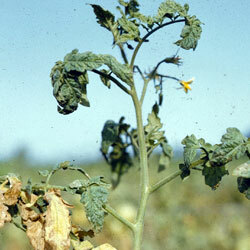 Got a question about tomato diseases or pests? Ask here. We have the most amazing group of visitors who answer your questions. It's help and be helped! High Plains IPM Guide, a cooperative effort of the University of Wyoming, University of Nebraska, Colorado State University and Montana State University. Copyright © 2009-2017 GrowGardenTomatoes.com. All rights reserved.